Splash for Children’s Health. Fun hot tub sessions are of great benefit for juvenile rheumatoid arthritis sufferers. July is Juvenile Arthritis Awareness Month, a chance to focus on one of the most common chronic illnesses that affect children. The Arthritis Foundation aims to increase awareness of the early signs of the condition – especially joint pain, stiffness, and swelling around a joint – that are often overlooked or misdiagnosed – and resources for families affected by the disease. Some 300,000 children have been diagnosed with juvenile arthritis in the United States. An appalling number given that there is no cure yet for juvenile arthritis. But, new treatments can slow or stop its progress and improve the chances for a better quality of life as the child ages. Water buoyancy helps support a broader range of motion. Water resistance helps strengthen muscles. Jet turbulence helps the child practice balance. Aerobic exercise in the water can boost endurance. Hot tubing releases endorphins-the body’s feel good chemical which lessens pain and elevates mood. Cool the water down to between 90°F and 94°F for aquatic therapy with younger children, maybe 100°F to 102°F for older kids who are going in only waist-deep. A good rule of thumb is 10 minutes in the water for every year of age – 20 minutes for 2-year-old, 30 for 3-year-olds, and so on. Make sure the water is sanitized to avoid risk of illness – the child’s immune system is probably weaker than usual. 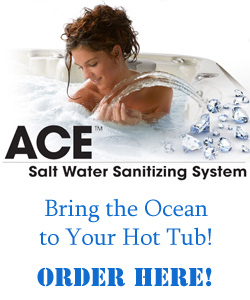 SilkBalance natural water care for hot tubs and spas is the best solution for sanitizing without harsh chemicals. It make the water soft and pleasant for a child with juvenile arthritis or any debilitating condition. For more information about juvenile arthritis, visit www.arthritis.org. For more information about the benefits of hot tubs, visit one of our 5 nearest Olympic Hot Tub locations. And, a FREE test soak in a Hot Spring Spa would be a great idea if your child suffers from juvenile arthritis.